Whilst in Radocofini last night we had all visited the local grocery store and been introduced to two local Tuscan dishes, both involved bread. The first Panzanella, a dish of onions, tomatoes, bread, oil all chopped up and serve cold. The second was Ribollita, a warm soup that basically contains any vegetables that are left over. These are placed in a pan and with the lid on made to sweat until they start to give of a juice. To the juice is added oil and finally bread. The secret is to let it go cold and then reheat the next day and the more time it is reheated the better and more mature the vegetable stock becomes. We had been told which restaurant to go to the night before and booked a table because they were so popular. Once seated we all ordered Ribollita and soon it was brought to the table. A steaming large bowl of hot vegetables, beans (flageolet) and bread with a ladle in for us to help ourselves. We all had three helpings it was that good. Back at the Ostello we had spread our things around a six bedded room so that we could keep it to ourselves, and after a really good night sleep we all woke early to get a good start on the 32km walk ahead. As Radicofani is on a hill, naturally the first six kilometres was all downhill. The road being a mixture of walking on the grass verge by the road or on gravels tracks when there was the opportunity to leave the road behind. Part way down we came across a sheep that had escaped out the field. Carlo managed to open the fence enough for the sheep to get back in and I proceeded to try to round the sheep up. It had other ideas. Every time it tried to get back in the field the silly think just ran straight into the fence rather than through the gap that had been made. Eventually the sheep got fed up this game and ran like mad away from us, we gave up to but left the fence open. Hopefully it did not get run over. When we turned onto the main road and stopped going downhill the path again move away from the road and followed the river bed. It as easy going and it was nice to be safe from being run over by crazy Italian drivers. From following the river bed we turned left past the ancient village of Formone and once the home of a post station dating back to the thirteenth century and a chapel. Now it has been made into a modern home. There is a saying....what goes down must go up, and true to that from we started to ascend round the hillside and into the next valley. We were blessed with warm weather and very little clouds in the sky so we had spectacular views all around us of the Tuscan hillside as well as back to Radicofini every now and then. Italy is peppered with medieval buildings and ancient pathways, sadly all to many of them in a bad state of neglect or disrepair. 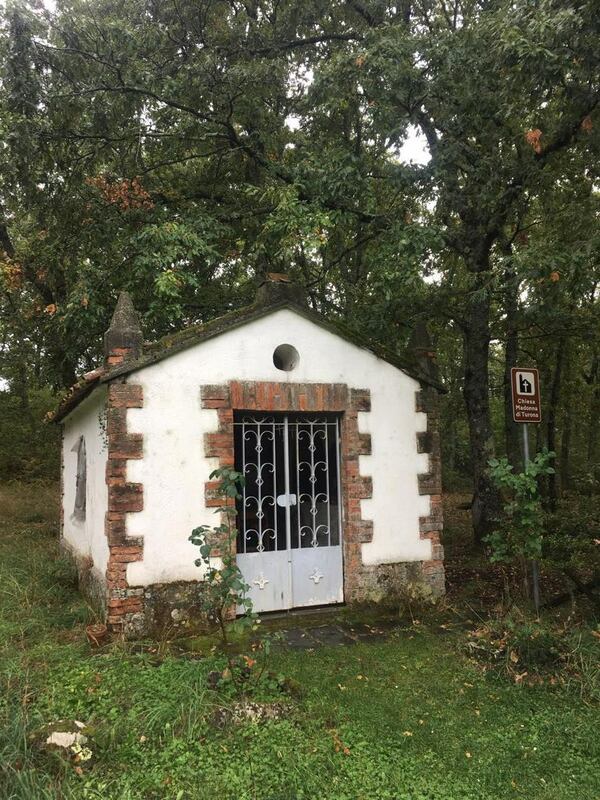 We passed through a small farm and chapel that was once the site of the Hospice of Bricole and a major resting place on the Via Francigena. Among its guest, Phiippe Auguste, the King of France and Charles d'Anjou's troops in 1288. In the 10th century it was mentioned as Abricula by Archbishop Sigeric. The farmhouse is a derelict mess and the beautiful tiny chapel that still has traces of the original paintwork has sadly been used to house farm animals and is now just full of poo! Why o why......this could be such a wonderful treasure for Pilgrims to rest or pass through again for them to receive their vitals! By now it was getting towards midday and it was hot and humid and with the mention of lunch I explained that I was familiar with somewhere not too far away. We pressed on and soon cam to the spot, except it was not the one I had in mind. We stopped and despite the area having a fair scattering of dog poo, we were too hungry and foot wary to care. We just made sure that the pesky flies stayed away from any food. needless to say it was not too pleasant and we certainly did not take our time to each lunch. Before finishing two pilgrims came towards us also looking for somewhere to sit and eat, there was no space near us and feeling guilty mentioned that we had passed by somewhere close to where we were currently. I pointed the spot out, a shady place for two complete with a table and a view across the valley. It turned out that they were two American Pilgrims, but only walking a short section and only carrying day bags. Their main luggage being transported for them. After a quick lunch we left the dog poo and the dog to add to the collection. We pressed on continuing to wind our way through the hillside along the tracks, every now and then stepping to one side as a car appeared, past us and covered us in a shower of dust...... A bit like being crop sprayed every now and then. By late afternoon we descended the hills side and briefly up the up the other side of the valley to Vignoni Bagno, home to a thermal natural spa, a big posh hotel and a large square thermal pool around a courtyard. Claire was eager to paddle in it but it was not one of those places so instead we decided to go for a beer and put our feet up and rest for a while. With the heat of the day and being tired the beer soon left its mark on me and once my shoes were back on I rather squiffly got to my feet and set off on the final ascent of the day. 250 metres straight up to the village of Vignoni, a small ancient stronghold with a Romanesque parish church and a tower from the eleven century castle. By 4.30 we were entering San Quirico it origins being Etruscan and the earliest mention of it being in 712AD. Our home for the night would be in one of the medieval buildings above the tourist information office in the old part of the village. It was a 26km walk today so we were all awake by 6am, washed, packed and all ablutions just about completed and in the cafe for breakfast by 6.45. 7am saw us outside the church in Piazza Chigi raring to go and with the final photos in the bag, off we went. It was a mild morning for me, Claire was wrapped up prior to taking her clothes off enroute, as is the norm and Carlo, because he's Italian he kept saying it's chilly, allora it's chilly. We descended below the arched road that takes traffic into the town, that sweeps round in a majestic curve with its many arches. The guide book was easy follow and the Via Francigena signs were plentiful as we ambled through the morning air. There was the occasional buzzard calling in the sky and Carlo pointed out two Roe deer in the distance, before they skipped away. I mentioned that wildlife is not something that I have seen a lot of whilst walking in Italy, I'm not sure why. After 4km and still following signs we came to a junction and with no clear indication where to go we turned right. At the farm ahead Carlo asked about the Via Francigena and where was Torrinieri, a place we were to pass through. The farmer explained we could continue ahead but it was not the Francigena path. We retraced our steps and at a railway crossing, Carlo asked the same question of a workman. "Eye well tha nose, there's lots o paths round ear. Francigena passes around ear two but if it were me, but it's not, eye wood carry on up thee er to next village and paths thee er! " Now I know he was not a Yorkshireman and we're not walking in Yorkshire, but I thought I would add the gist of what was said in my own words. We had clearly missed the turn off to the right and we're a bit confused as we had passed a number of signs leading this way. We pressed on knowing that we would eventually join the path. The original route did pass over the busy Via Cassia road further East and we did the same but only west. I decided to take the safe route and following the path under the road and as I made my way there came across a Via Francigena marker! Now I won't damage the readers eyes by putting into words what I may have said at that point in time, but Carlo beckoned for us to cross the road as it was quiet and we crossed over to the other side. Our journey continued following the occasional VF marker along rolling sweeping fields, barren from any crops but still exuding their own beauty in the colour of the soil and the contours of the land in the fields. We climbed and climbed the valley and after a few kilometres met up with the official route coming from our right. We gladly followed it into the town of Torrenieri and at a cafe decided to have second breakfast. I went inside with Carlo to order and Claire went in search of a bakery for supplies for the journey ahead. 10 minutes later she returned successful but apologetic that the bakery only had one type of bread. A hard crusty brick and white at that too. I'm not sure why but the Italians do seem to enjoy this type of bread and even more so...white bread. Claire and I enjoy the more majestic savouring of a good dark bread, brown/black with either seeds, grains and other sumptuous delights we may come across. The one we like also keeps you regular too, white bread just clogs your insides up like glue. Carlo mentioned that as he'd finished his coffee he would go in search of a sandwich and we should join him on the edge of the town. With coffees quaffed we donned our packs and went in search of him. I spied him ahead before he disappeared from view and we made our way to meet him. As we reached the crest of the main street we saw he'd entered the local coop, something Claire had not seen as she'd not ventured this far out of town. We went inside and at the bakery section decided to ditch the white bread in favour of Panne multicereal. I think our bodies were giving off sighs of relief as we paid for our goods. Our journey continued away from the village and by now it was around Pellegrini time, on this occasion our Pilgrims looked very different. The first a women carrying a decent size pack, suitably dressed and looking confident as she walked. The second, a man that looked as though he was drawing his last breath, very weather beaten looks and wrinkly (if I may say that?) and carrying the largest pack I'd ever seen. It not only looked as though it was heavy but the top part had a an unusual square wide top to it, was there a piano in there too?. He was also carrying a large plastic bag which gave the impression of being heavy too. His walked ever so slowly and carefully placed each foot down as he shuffled forward. We looked back in amusement half expecting him to have expired on the path, but he hadn't. We pressed on slowly ascending and winding our way through the undulating valleys with the sun providing some winter warmth so that one by one, in our time we stopped, removed a layer of clothing and then continued ahead comfy that we were not too hot or cold as we continued. The area we were passing through was called the Val d'Orcia an area that was added to the UNESCO World Heritage site in 2004. As we walked through it you could certainly understand how and why such a prestiges accolade has been given to the area. Before arriving in Buonconvento we traveled through the vineyards of Castello Altesi and the wine making factory and I'm always amused to see signs that invite Pilgrims in for an afternoon meal that includes wine. I wonder how many Pilgrims take up that offer? If I chose that detour I know that the rest of the afternoon would have to be written off for a cheeky sleep. The grape vines extend for 400 hectares and at the edge stands castle originally built in the thirteenth century by the Altesi family but not completed until 1441 by the Tricerchi family. It was used as a fortress for Pilgrims marching to Rome on the Fracigena road. IN 1982 it was declared as an artistic and historical heritage site and is an imposing vision along the path. 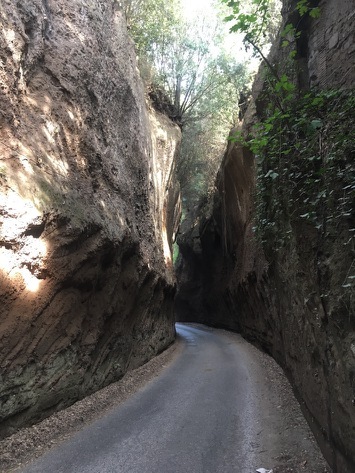 The journey into Buonconvento took us along the Via Cassia once more. The village is described as one of the most beautiful in Tuscany but like most modern places it's a place of two halves. On the periphery is a modern urban sprawl that is just that. But at its heart is a medieval centre of narrow streets, old houses and obvious signs where horses were tethered in the streets. The name Buonconvento comes from the Latin "bonus conventus' which means "happy, lucky place". We took advantage of two benches side by side and stopped for lunch. Once again the usual routine unfolded, boots off, empty plastic bags laid down as tablecloths, food spread out and me with penknife in hand liberally chopping everything that needed reducing in size. Once our appetites were sated, we packed up and headed for a coffee and another opportunity to take the boots off. 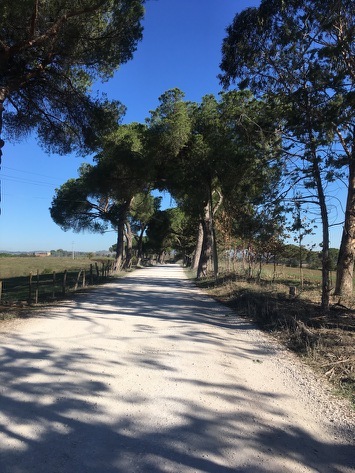 By mid afternoon we were taking the final 90 minute walk through the heavy, thick wooden door in the archway of Porta Senese of the village and back out to the lush autumn countryside. 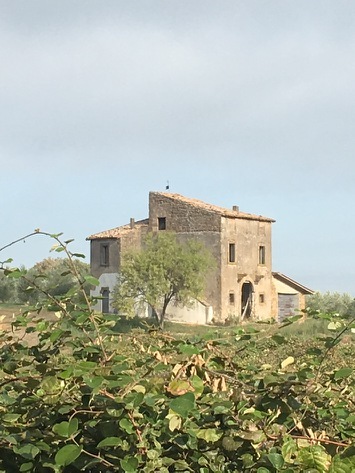 We wound our way up and down hill, between fields now barren of any crops but still with their own beauty to reach the accommodation of the night - Centro Cresti, a big old farmhouse on the main road. Downstairs there is a large dining and sitting room with a huge industrial size kitchen. Upstairs there are several rooms all of different sizes and for our evening ahead, the house was teeming with Pilgrims from all nationalities - Canadian, American, Dutch, English and Austrian. We located some empty bunks and commenced with our own nesting process ready for a good nights sleep ahead.......hopefully. After a day's rest we are now three Pilgrims walking together. The previous night my good Italian Pilgrim friend Carlo Carli joined us and will be walking the next three stages with us to Siena, our next planned rest point. The day was going to be a tough one so we all set off bright and early after picking up food for the mid-day meal. Radicofini sits on the top of a hill and there were two ways to get there. The first route is along quiet country lanes and through fields but the total mileage would be 32 km. The second route meant walking the first 10 km along the busy Via Cassia road and reducing the total mileage by 7 km. We chose the shorter route! After only 2km we passed the first Pelligrini, three Italians going the other way, heads down and just getting on with the journey. We all called Buon Camoni across the traffic as it whizzed past. At the 4th kilometre Claire was undertaking the now familiar routine of taking her clothes off......I won't say much more because that way it's more fun just leaving the reader in suspense. We all pressed on walking in single file, heads down and also just getting on with it. There was the odd accession when there was a brief respite as we followed parts of the old road away from the new section. It was no more fun but at least there was no chance of us being run over. Conversation was limited to the odd occasion when it was safe to talk and by lunchtime we had reached the half way point, where we turned off the road and onto a gravel track that would take us nearly all the way to Radicofini. We stopped at the cafe and all refuelled. By now it was after Pelligrini time where we met others coming the opposite way. As we stepped onto the pavement a very smartly dressed gentleman stepped towards the cafe and I immediately detected and English twang. I bid the smartly dressed gentleman good day and he reciprocated. It transpired he had set off from London. Now as the three of us continued on our way, we all agreed that our English Pilgrim did not really look like a walker and certainly not one that had walked from London. I agree there is no such thing as the stereotypical long distance walker, but this gentleman looked as though he had just stepped out of his house complete with smart soft loafer shoes to walk in. The second half of the day involved a long slow uphill walk on a chalky stone pathetic was very slippery and steep in sections. The only real benefit of the section being the stupendous views we were rewarded with all around as we just climbed and climbed and climbed. Every now and then we did get a glimmer of Radocofoni on the horizon, way up in the sky and far away. The afternoon air was humid but there was the occasional relief of a gentle breeze as we climbed and climbed and climbed. Claire mentioned that the final part of the walk was almost equivalent to the height of climbing a small Munro (Scottish mountain) due to the height in meters we were ascending. Eventually by late afternoon we were making the final journey through the old gateway into the medieval street to reach the end of the stage. We were early to check in, so after taking photos of where we had just walked from we sat down for a glass of wine in the sun. Whilst sitting there a Hearst rolled up and parked outside the church where we were. The driver got out and he approached Carli and started chatting away. It transpired that the driver was also one of the caretakers of our pilgrim accommodation, he mentioned that he was busy with the funeral and apologised that he'd left the keys to our lodgings at home. He would go back and return within the hour. Mmmmmmm after nearly two hours, we were starting to get cold and fed up of waiting but he finally arrived. We were grateful to be inside in the warmth and with all the formalities completed we settled into our own room, spreading ourselves across the various beds to make it look like it was a bit full. It's not the normal procedure for Pilgrim accommodation but as there were plenty of other rooms we did not feel guilty at our transgression. I have had the pleasure of staying at this accommodation before, it is warm, very comfortable and has the added bonus of a decent kitchen for self caterers - we were not one of those. 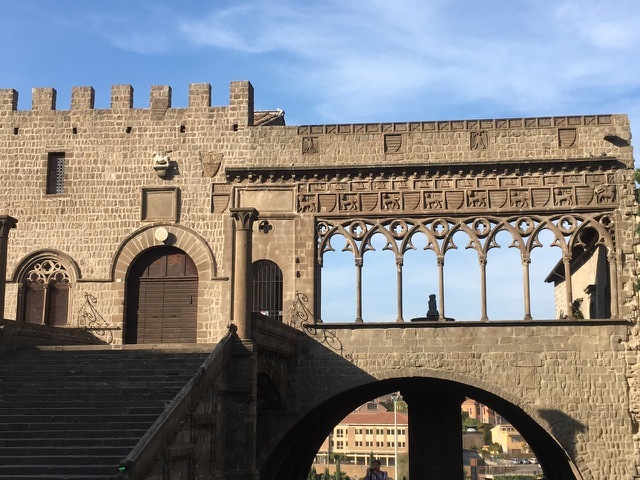 We had arrived in Viterbo the previous day and then spent nearly 2 hours deciding on accommodation. We were wet and tired and the thoughts of staying in the Covent with other Pilgrims in one room and nowhere to dry clothes put us off staying there. I tried unsuccessfully to plead a bargain deal with the Zodiac hotel, somewhere I'd stayed previously, but I was unsuccessful. We did find somewhere else that offered rooms for €15, a good price, but when we asked for directions found that it was 2km further on to walk. I'd past by a B & B next door to the convent, so with a script prepared, I called and was greeted by a very excited Italian Senora. Between both us I secured a good price that included breakfast and explained we'd be there in 5 minutes. Upon arrival the Senora was still excited and talked at hundred miles an hour and left me quite exhausted listening to her. We were shown to our room, a bit like Fawlty Towers, lovely green decor, some very inexpensive pictures probably from a car boot or from a grandparent left in a will! But on a positive note and something that was expressed throughout our stay..............it had a lovely balcony overlooking the Santa Cristi Piazze and the church. Our breakfast was exceptionally brown, but Claire did manage to have a Latte prepared by me, in what could only be described as a soup bowl because only the English do mugs. Needless to say we soon left the place and made our way through the medieval town. 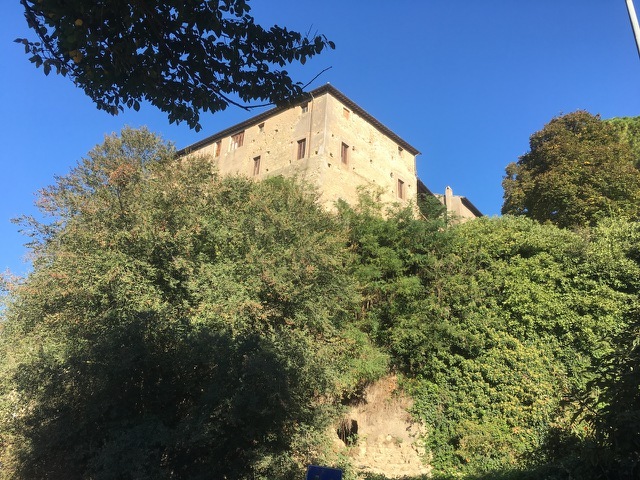 The route took us up a long flight of manageable steps to the castle at the top and there we were blessed with via Francigena signs everywhere, going in all directions and bearing no resemblance to my guide book. After some comings and goings and much scratching of heads we finally identified the way forward. The day was going to be of two halves with an afternoon lunch stop at San Lorenzo Nuovo and today we were blessed with cloudless skies and an anticipated temperature around 24 degrees. We took our time leaving the edge of the town, taking every opportunity of taking photographs back across to the castle and the lake below with a backdrop of a cloudless blue sky. Initially the journey was a slow steady climb past the Roman town of Volsnii near the site of the Etruscan settlement of Veltna, conquered by the Romans in 265 BC. Within thirty minutes we were once again walking between olive groves interspersed with views to our left of the lake unfolding between its branches. Parts of the route were being cleared by a couple of the local people, we chatted away in our own languages and in-between laughing I offered to swap my pack to do some of the work. It was easy going as we both settled into our walk routine of scouring the way ahead for the Via Francigena signs peppered in all manner of places, some easy to locate others just wrapped around the odd twig of a tree. The final part of the journey to San Lorenzo was not that pleasant as it involved 3km of the very busy and windy Via Cassia road. There has been an ongoing dispute with a land owner over the rights of way of a track that runs through his land. Obviously his quite happy for walkers to be either run over or killed on the road. In San Lorenzo Nuovo we met a Canadian family who had spent five months travelling, what a fabulous experience for the children. Mum and dad were carrying enough for all of them, their walk taking them from Siena to Rome - two weeks on the road with no electronic gizmos or gadget. In the town we made our way to the cafe in the Piazza, ordered two beers and paninis for lunch and sat in the sun and just talked about nothing and something. As we sat we were reminded of the influx of immigrants in Italy as there was a small group in the square totally engrossed in their mobile phones. After settling the bill we were back on the road, the way ahead I remembered as not that interesting as we would slowly wind our way around the fields to Aquapendente. How wrong I would be! Part way through our journey along the fields Claire stopped to remove some articles of clothing......she's getting good at that as we walk together. Once dressed more comfortably we pressed on. About a kilometre further on Claire suddenly stopped...."my walking pole, where's my walking pole"? She exclaimed. "O know, I've left it back where we stopped"
Like a true gentleman I am, I quickly threw off my pack and ran all the way back there to retrieve the walking pole. Claire obviously thought this was a truly heroic deed as unbeknown to me she felt it was an appropriate opportunity to record my marathon sprint. I have to say having seen the video, I was quite good and my running style is very professional! Once stick was retrieved we progressed through the fields and by late afternoon we had arrived at the hotel Il Borgo that was going to be our home for two nights. We woke early in our cell of the Convent having both slept really well. It was dark and gloomy outside, but then we were on the top of a hill. We returned to the cafe in Pizza Emanuale to make use of the free wifi and to have breakfast. Today was going to be a wet one and before we left the sanctuary of a warm dry inside space, the heavens started to open and the rain just fell out of the sky. We slowly put our waterproof clothing on and bravely stepped outside. There was no point playing dodge the puddles as we travelled along the medieval street and through the ancient gateway. As we left the old town there was a brief respite in the weather. Our journey took us past St Flaviano church, well worth a visit inside if you are every in the area. On the outskirts of the new part of the town we decided to make the days walk shorter by taking the route along what was described as a quite road. I think the gods were against as once again the heavens erupted as the rain fell out of the sky. As we stopped to let a car pass by at a junction, it stopped and the window came down and a very nice lady proceeded to ask if we need an umbrella and started to take hers off the back seat and started waving it as us. We politely declined saying Grazie mille, Grazie mille.....many thanks but no thank you. We all went on our way and as we trudged through the rain we both acknowledged what a wonderful gesture that was. The road was not quiet and the rain did not stop. On the odd occasion we tried to seek sanctuary under trees to avoid the heaviest of the rain but it really was quite futile and so rather than stand and get cold we pressed on. After six kilometres we left the the road behind and the traffic and soon we were again travelling along the old Roman road of the Via Cassia. From the Roman road we continued along descending through the woods. It was poorly marked and the guide book was not much use and with paths going in all directions but slowly we made our way. The book mentioned crossing a stream by a derelict house and as I pressed on Claire called me back pointing to markers I had missed on the left. I was sure that I was going in the right direction and mentioned that but decided that maybe I was wrong and decided to follow the directions Claire had found. As mentioned in the book it took us across a stream but not one with a bridge. We gingerly crossed over using the stepping stones that had naturally fallen as a vague route and yes there was a ruined house but on the wrong side to what the book had described. We ascended the bank and up the hillside to come across a very clear stone track with a Via Francigena sign pointing to our right. The route we had decided to take was obviously a short cut someone had created. I may point that out in my walk notes so that the readers can then make their own decision as to which route they take. It was well after midday and we were both hungry. At a small chapel there was a picnic bench and we decided it was an ideal spot to have lunch. Whilst stood there acorns occasionally plopped out of the tree either onto our heads or the floor. As we laid out our meal of slightly hard Foccacia bread, cheese and tomotoes the sky once again decided to grace us with some wet stuff once again. We hurriedly packed everything away but not before my sandwich got a bit soggy. On the plus side it made it a bit easier to chew. Needless to say we skipped desert. The afternoon saw us slowly wind our way up through the woods ascending one side of the hillside before we started to descend into Bolsena. As we rounded a corner the lake just unfolding like a carpet before us and below us. We both stopped to take some pictures and as the rain had stopped, remove some clothes. As we entered the town we looked like two tired travelling tinkers, with our clothes hanging from our rucksacks but we didn't mind. We had made it and we were mostly dry except from the perspiration from the 80% humidity. Viterbo is truly a wonderful place for a Pilgrim rest day. Our apartment had everything we needed, a washing machine, his and hers sinks, a kitchen with an oven that tripped the electricity and a gas hob that needed turning off on the main tap because it leaked! Despite those few quirks, it was very comfy and very central. Our rested day had consisted of walking through and around the walls of the old town, winding our way through the streets following the direction of the walls. Three quarters of the way round I came across where I had stayed before at a Franciscan Monastery, my accommodation being in one of the old towers that line the walls. Claire and I ventured inside, wandered around the Cloister graced with frescos on all four sides and poked our noses in all the doors we could find open, unfortunately the church was not one of those. We continued on our way and shortly after midday we went back to where we had eaten the night before - L'Accheta. We sat outside and had a two hour lunch, drinking wine and dining on a platter of battered fresh vegetables, cheese, bread, salad, olive oil and balsamic vinegar. Before we sat down the place was empty with only an hour before closing. After we sat down the place suddenly became a hive of eaters commandeering all the tables inside and out. I suggested that I should ask for commission for bringing everyone in, but my Italian does not stretch to that manner of conversation. We slowly made our way back to the apartment and I checked how far we had walked - 10.6km, not bad for a rest day. We woke early and were leaving the apartment in haste, both excited at the thought of spending some time in the Thermal pools along the way. Initially the journey saw us making our way along one of the main roads out of Viterbo and then past the cemetary. Viterbo must have a lot of residents or maybe just a lot of people die there because the cemetary has been extended and there is now a large, very modern, several storeys highs gothic monstrosity at the side of the old one. It has to be seen to be believed. After 7km we came across the pool and as we had been told by other Pilgrims it was very busy with the car park almost bumper to bumper with Recreational Vehicles or Camper vans as I would call them. We paid our Pilgrim fee of €5 and received a stamp for our pilgrim passport and then we were in. We had both come prepared and soon we had just whipped our clothes off - Claire down to shorts and short top and me down to my Budgie smuggler type pants! I have never been in a thermal pool and although it smelt like rotten eggs, once in the water it was lovely and warm and very soft. There were five pools or Bangos (Banyos) virtually full with bathers of all shapes, sizes and ages and I was immediately struck with the thought of wallowing hippos. But that would have been cruel to the hippos! Claire made me go in the plunge pool which was ice cold and I'm sure I had something before I went in but couldn't find it afterwards! An hour late and with a decent days walk ahead we got dressed and continued on our way. We had missed Pelligrini time, 11.30am, but after only 2km we stumbled across a couple sat at the side of the path in the shade resting from the heat. We bid them Buon Camino and continued on only to pass another six more within the next 4km. With 6km to the end of the walk we reached the best part of the day and something I was excited for Claire to experience. We passed under a railway line for the second time and then turned right to walk parallel with it. The track soon changed from Earth to large black cobbled stones of all sizes, carefully fitted together to form a path. I asked Claire if she knew what this was and she replied...."a Roman Road"? Yes but not just any Roman road, this was the Via Cassia AD500 and it most places it looked like it had just been built. Our pace slowed, not only because of what we were walking on but also because by now the path had started the long ascent into Montefiascone. 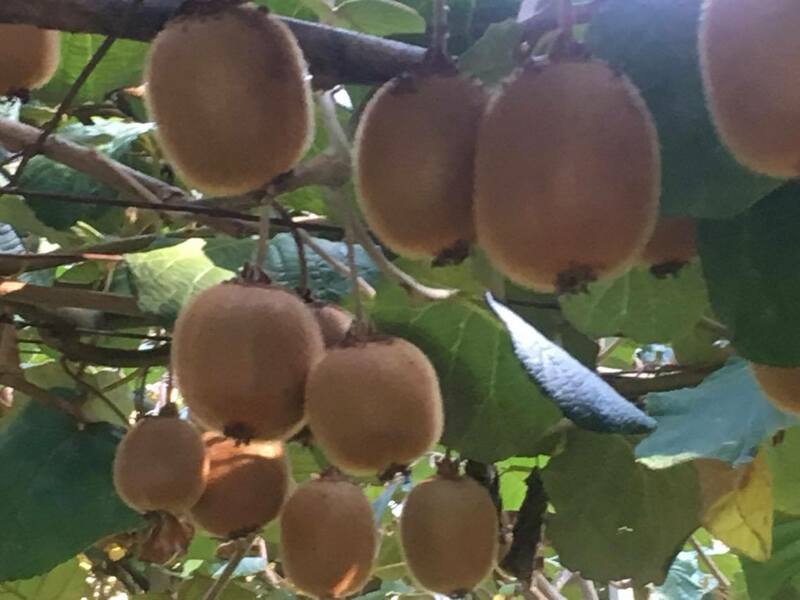 Our path along the Via Cassia passed through olive groves, hazelnut trees and kiwi fruit groves, with the fruit of the kiwi looking very unpleasant, see the picture to draw your own thoughts. The final few kilometres involved a 1600 foot climb up to Montefiascone, but it was well worth it once there. Before we walked through the old gate we made our way to the view point and looked out over Lake Bolsena, the largest volcanic lake in the world. It was once a chain of volcanos that over successive eruptions all collapsed in a on themselves and left the crater which over time filled up. There have been two further eruptions from Volcanos beneath the water and these have created two islands in the lake. 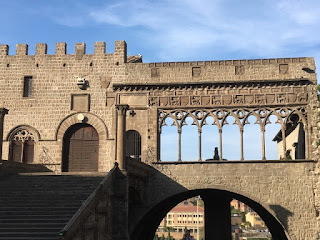 We walked through the door and at another view point we stopped for photos with the two iron pilgrim sculptures and the made our way to the Piazza Emanuele and the end of the stage. Once the route had been saved on my GPS we made our way to the Instuto Divini Amore (The Sisters of Divine Love). No not some hippy 60's love institute but a convent. I rang the bell and explained who were and soon we were ushered in by a lovely bubbly Sister who looked about seventy and was only about four foot tall. After our passports and Pilgrim passports were handed over we were shown our cell for the night. Two comfy single beds and showers either end of the corridor. The Sister explained that we would receive an evening meal and she would come and knock on our door at 7.30pm and take us to dinner. At just after 7.30 we were taken to the dining room and a feast was spread before us, fresh fruit, fresh cheese and bread, water and a bottle of Est Est Est rosso the local wine. I had mentioned that I was a vegetarian and for our first course we had fresh pasta in black pepper and then had a platter of fried eggs on salad leaves brought. It seemed a real mixture of food but it was heaven. We took our time with our meal and once completed our Sister arrived with our passports and we handed over the princely some of €20 each, all that was asked for our bed and evening meal. The generosity and kind we received was very moving and we had many laughs over trying to talk to each other, not really understanding the true gist of what was being said. It's probably not a common thing and maybe you could call it a tip but from the change I received I handed it back saying Donativo......a donation. We slept like babies that night. 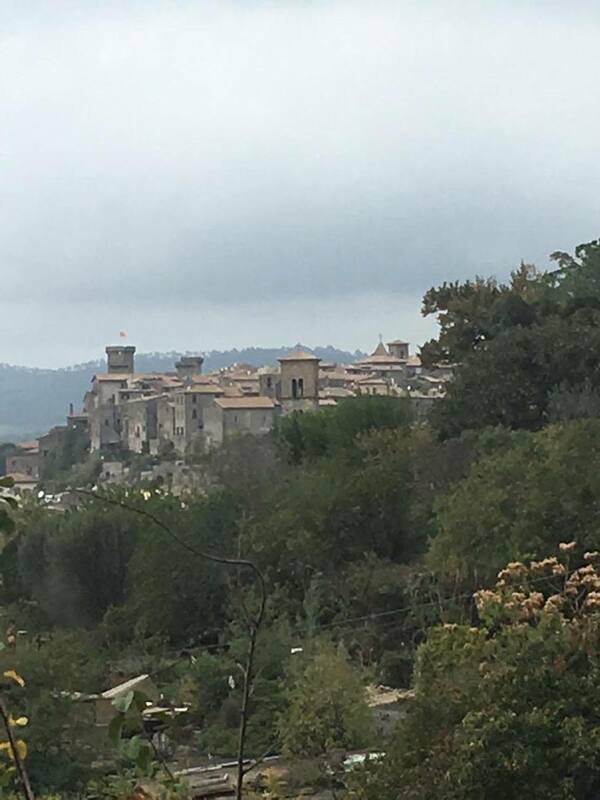 Sutri really is a magical place and if you ever get a chance in life to visit it, I'm sure you would not be disappointed. We woke early and after the usual brown breakfast we decided we had enough time to go and have a look round the medieval centre and then buy provisions for the days walk. We made our way towards one of the many view points and were provided with a beautiful early morning sunrise with a wisp of early morning mists in the air - it was going to be a hot day. Moving on we came across small nuggets of Roman and Etruscan past life, most notable the main arch into the central piazza. After buying our healthy lunch provisions we quickly made our way back to our accommodation and soon we were on our way once more. We retraced our steps back out of the town and made our way along the small road that skirts the base of the tuffa rock the town sits on. A quick left turn saw us soon leaving the few tourists behind as we wound our way along the valley floor. The peace and quiet was deafening in the morning sunlight as we slowly made progress. When I had past this way before there were three bridges to cross as the traveller crossed from one side of the stream to other. Then they were really precarious and in serious need of repair. The first one we came to had been replaced in a simple way - four large logs just strapped together, and the remaking two no different. Well on a positive note we were never going to break the handrails because there weren't any. After 4 km we had reached the final point of the valley and we turned right and slowly started making the ascent out of the valley. Now there is a saying that what goes up must come down and that also applies when walking unless your on a beach or in Lincolnshire, England. As we rounded a corner and started a very steep descent, still slippery from the morning dew, we were rewarded with a breathtaking view ahead and above us of Capranica, our destination for second breakfasts. All to soon we were at the bottom of a second valley and once again we started the slow ascent up. 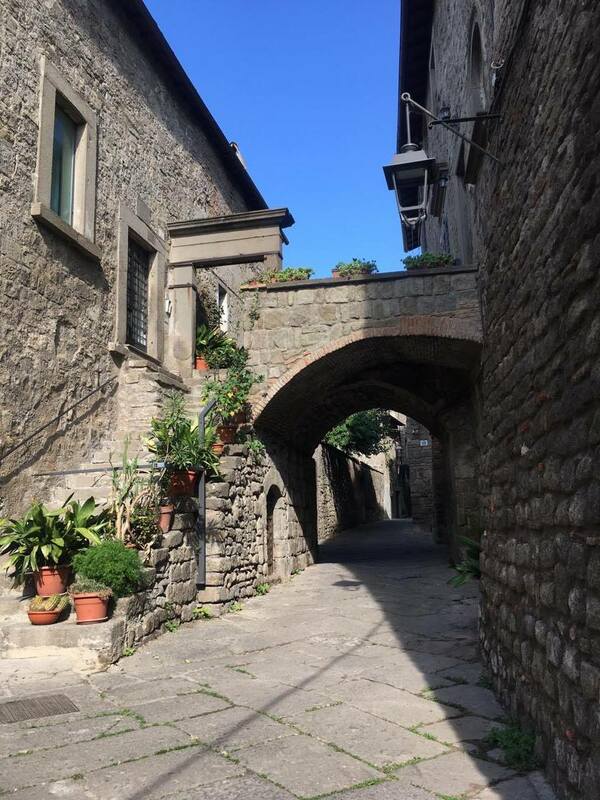 We entered Capranica through one of the two Roman gateways and wound our path along the medieval streets, bustling with cars and people and the first of a few Pellegrini's we would meet through the day. We did not have time to really have a look around the town and we merely made a bee line along the Main Street and out of the other side and stopped at the first cafe we came across. By now the day was pleasantly warm to sit outside and Claire went inside to order our usual coffee choices an two Cornetto a la creme's. Before we feasted on our pastries "Wee man and his new friend Jessica rabbit had to get in the act and take a selfie photo of them posing with the pastries. Once completed they were soon devoured and we were then back on our way. About one kilometre down the road, just before we turned left out of the town, Claire suddenly stopped and uttered "I didn't pay for the breakfast" We made our way back and Claire apologised profusely for having left without paying.....I think we had just stopped the owner calling the Carbinere to put an (APB) all points bulletin out for two suspicious Pellegrini, a small Irish man and a rabbit last seen leaving a cafe without paying. Well we thought it was very funny. After paying we continued on our way and before long we were soon meeting up with more Pelligrini going the other way. Our route was a pleasant one, along an easy gravel track that passed between olive groves and close by the railway line. I had not walked this route before as I had decided to miss Vetralla out, instead taking in a more direct route from Viterbo to Sutri via a Cistercian Monestary. We left the olive groves behind and with only 10km until the end we were sure to reach our Airbnb accommodation by 4pm as I had informed them. We turned left away from the via Cassia main road and were informed by the guide book that after 500 metres turn right. When we got to that point, there was a barrier across the entrance and it went straight into a hazelnut orchard. We felt that this was not correct but instead continued ahead. There were no more Via Francigena markers ahead so we stopped and reread the instructions. After much discussion we decided to retrace our steps and go back to the barrier. I mentioned to Claire that despite two VF markers either side of the barrier, it was not that way through the orchard. We turned round and carried on down the hill towards the railway line, we crossed over despite the map in the book clearly showing this was not the way. I was aware that there Re sections of the path that have been changed or diverted so with that though I felt we were correct in our assumption of where the path was. A car slowly rolled up to us and the driver said "Pelligrini", "Si" I replied. I pressed on with "Via Francigena"? He then proceeded to give us directions from where we were. By now the day was getting late and we had yet to have our lunch. At a small orchard we spied an agricultural building and a suitable place to sit rather than using the ground. We made our way there and while I prepared our lunch Claire went for a "wee" walk. After a well deserved break we returned to the path and after 2km we came across what ruined out to be the correct path on the right coming out of the hazelnut orchard. I apologised to Claire profusely and I meant it too. 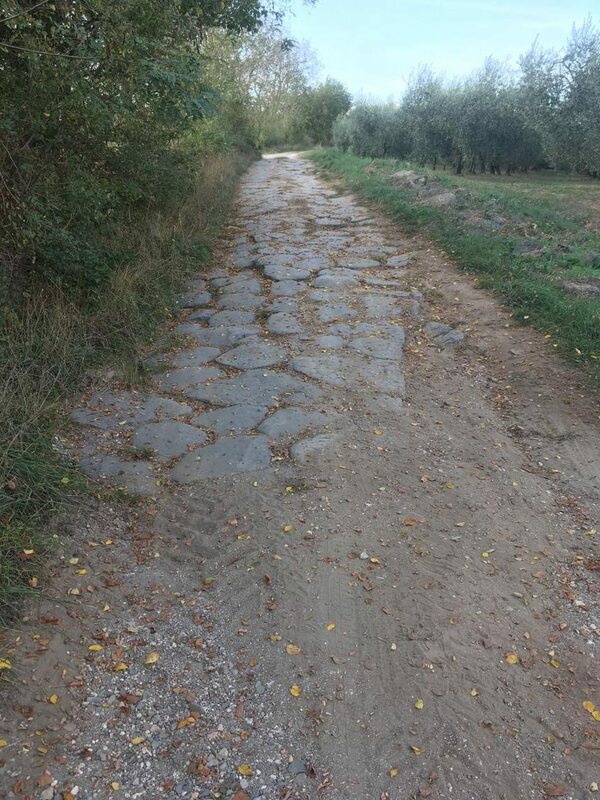 We pressed onto the via Cassia, crossed over and proceeded through an olive grove. It soon transpired that either we were wrong again or the path was not too well marked here. I told Claire to hang around while I retraced my footsteps back to the Via Cassia to have a good luck round. I couldn't find any more signs so assumed were correct, we pressed on a bit further only to decide that clearly somethings was not correct. We decided to go back to the track before we had crossed the road and try from there. 1km back the way we had come Claire pointed out a VF sign we had both missed! We pondered the map, tried to interpret reverse directions and both declared this was the correct way. By now it was well after 4pm and I set a new message to our host that our new ETA would be 6pm.......how wrong I was! On the outskirts of Vetralla Claire declared that her pack had to come off as her back was sore. No sooner was it off then she was laid flat on her back on a picnic table with her knees up massaging her back. Thank fully there were no visitors to the park at this time of the day. Before we set off I made Claire reduce the weight of her pack by off loading some of the content into mine. As we set off Claire was now skipping along and I was struggling to lift my legs with the increased weight of my pack. We slowly made our way into town, 5 km further from our last stop and by now the light was beginning to get dark as the night drew in. I sent a further text to our host around 6.30pm to say that we were walking along the main road, via Roma and we'd be with her soon. 10 minutes later someone called Tony, Tony and it turned out to be our host. I don't think that either of us have ever been so pleased to see someone. We were whisked away to out medieval apartment that everything and more for our comfort. We packs off and once instructions had been dispensed about where to leave keys, where the towels were etc I asked about the nearest Supermarket. I was informed that the supermarket was outside the town but there was another close by but was closing in five minutes. After we'd said goodbye to our host we ran like we were being chased by the devil to get to the shop before it closed. Needless to say we managed it and we managed to buy everything we needed for a comfy night, including beer and wine! A ' Pay As You Feel ' facility is now available on our website. Our self guided and guided walking holidays do help fund our work, but research, planning, walking and GPS plotting 'new' historic abbey to abbey routes do require additional financial support. Our research walks take place in the UK, France and in Italy. This walking is currently funded by us but we would love you to help support this important historical, cultural work going forward. The non-holiday routes on our website are free for you to download, print and follow at your leisure and convenience. Please help us continue providing you with this Abbey Walks service ! Our previous night's evening meal was an interesting one. There was no sight of a restaurant open in the old town and after buying provisions for the next day's walk we headed into the new part. Again there was no clear evidence of anywhere to eat so I switched to searching the internet. Only one place appeared to be a possibility but the reviews on Trip Advisor mentioned the grumpy owner and how he told you what you should have to eat. Good fortune was not on our side, we were both tired and hungry and a little grumpy ourselves so rather than walk around in search of anywhere we returned into the old town. As we headed back to the chicken shed we saw lights come on at a restaurant. We stopped and gazed at the menu as someone came out of the restaurant and totally ignored us. Desperation has a mind of its own and we decided that short of resorting to cannibalism we'd head inside. Needless to say it soon transpired that we had entered the same restaurant with the grumpy owner and, yes, despite me trying to ask for one of the dishes to be made vegetarian, he told us what we were going to eat. We both just said..."Si" ordered wine and proceeded to just get merry. The food was not too bad, the wine was young as Claire declared and the price was cheap.....how could you not be happy with that. Well I guess when you had not ordered it! The night past without further adventure and no cockerels woke us up as the dawn broke. We dined on fresh eggs and toast for breakfast all washed down with strong hot coffee. With our packs loaded and once more hung on our backs we set off bright and early. We descended out of the medieval town into the Parco deal Treja, a lush green carpeted valley, peppered with young chestnut trees. By mid morning we were walking past Monte Gelato Ranch, I was curious to go and find out if it truly was a giant ranch made of ice cream, but the urge to reach Sutri by mid afternoon stopped me in my tracks. By 11am the slow trickle of Pelligrini coming the other way, heading to Rome started. Again all different nationalities, some with stories of where they had started, some just clearly not wanting to stop, but all cheerfully saying "Buon Camino". We have decided that from just before 11am to about lunchtime it is now called Pelligrini time! Claire had a her first taste of what was to be in store historically on the journey to our end point, Massa, as we crossed over a Roman road AD 3 that looked a lot fresher than we felt. Midday saw us arrive at our half way point, Monterosi and once again it was boots off and feet up as on this occasion we sought the shade from the hot sun, today it was going to be in the late 20's. After a thirty minute rest, we went in search of a Tabbachi to buy fresh water and once our bottles were full we continued on our way. The second half of the day was a leisurely march between one of the biggest golf courses I had ever seen and then once again though hazelnut orchards on both sides of the track. 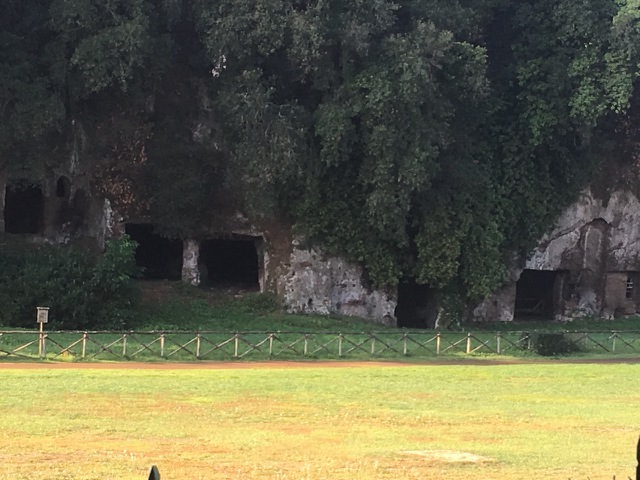 At 3pm Sutri was in sight and the final leg saw us walking along the via Cassia main road to Rome and alongside Etruscan caves carved out of the tuffa rock. We stopped at the small Roman amphitheatre that is also carved out of the tuffa rock but unfortunately it had just closed. I was keen for Claire to experience seeing it from inside and in my best Italian I asked the attendant if Claire could be allowed in. I mentioned that we were Pilgrims walking from Rome and we had just walked 28km to get to Sutri. My charm paid off and Claire was allowed in, and yes she mentioned it was a worthwhile experience. Our accommodation for the night was a bed and breakfast in Sutri itself, a beautiful village perched on a huge tuffa rock, with evidence of Etruscan and Roman occupations all around. We could not get into our bed and breakfast before 4pm so we made our way to the main square to sit down and have a beer, another daily ritual that we were to undertake. We were soon surrounded by other Pilgrims that had come from the other direction, swapping stories and laughing at our individual experiences. With beers drunk we head off to our accommodation which turned out to be a fabulous apartment, tastefully and artfully decorated by the owner Vittorio. The icing on the cake for both us was Rocco the dog, the most mild mannered and placid of pooches either of us had met. Rocco was a stray, something that is common in Italy, and had found Vittorio by chance and was soon ushered into his home and becoming part of the family. We were told that we could not take Rocco with us and that he was not staying the night as both owner and dog were going to Rome later that night. After a good night's sleep we both woke fairly early for breakfast which consisted of a reasonable buffet of fruit, yoghurts, eggs, the usual croissants, dried crisp toast and cake. We made use of these offerings which also provided for our lunch too. We also made a bee line for the local supermarket on the edge of town to stock up on fresh tomatoes, avocado and cheese. This was to become our staple diet for future walks. The journey was a pleasant one out of the town and soon we were leaving suburbia finally to be absorbed in the lush green countryside adorned with peace and tranquility, something we had strived for when we left Rome the previous day. The first part of the day was an easy and pleasant journey along quiet country tracks through Isola Farnese. 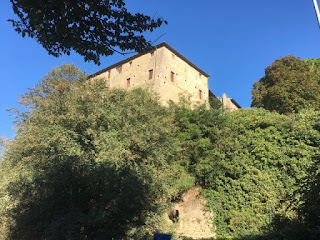 The main hillock just before the turn off the road being the site of a small medieval fortified settlement, now just one residence but formerly belonging to the important Farnese family. At one point we almost had to act like sheep dog as we chased a flock of sheep along the track together with the farmers dogs. As the animals moved along the bells around their necks tingled and rang out and I felt like bursting into song about a lonely goat herd, just like Mary Poppins........much to Claire's relief I refrained and just sung it in my head. The last time I had been this way I had had to ford a stream, my guidebook mentioned a potentially dangerous river crossing but it was more like a puddle the last time I crossed it. The Via Francigena attracts a lot of European funding and since my last journey there has been a lot of improvements made, including new signs. On this particular section the dangerous river crossing has been replaced by a bridge so now we will all stay safe Pilgrims and not be swept away never to be seen again! We pressed on trying to interpret reading the guide book in reverse which is not as easy as it may sound. 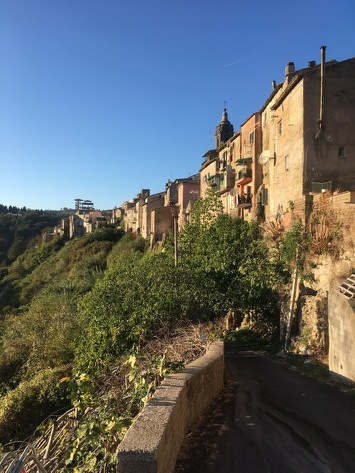 Between scratching our heads, looking around to interpret the notes and retracing our steps it took a little longer to reach our halfway point, the historical town of Formello. 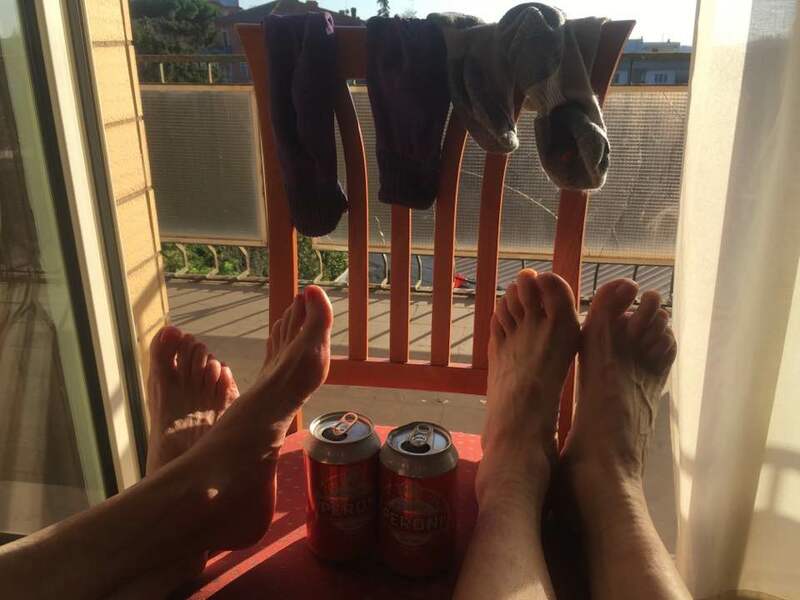 We stopped in the main piazza of the old town at a small locanda, order two small beers, took our shoes and socks off and put our feet up. This ritual, not the beer unfortunately, is an important routine that has to be undertaken at almost every reasonable lengthy rest period, to keep the feet happy and eager to carry us on to the end of the day. The day was to be a long one and up to now we had not seen any other Pelligrini. Soon we were on our way, there was a steep ascent out of Formello but with heads down and by just concentrating on putting one foot ahead at a time we reached the top. We were relieved to be blessed with a gradual descent along a quite country lane but as the route changed from Tarmac to a stone track the way ahead started to climb as we meandered through the Sorbo valley. Eventually we reached the summit, but definitely not the last climb of the day, and the Santurio della Madonna deal Sorbo. A beautiful buff coloured church that sits on the edge of the hill and visible from almost every direction. As we changed direction and started to descend slightly our path switched from stone to Tarmac once again, providing our feet with some slight respite from the sharp stones. Our lesson for today was that every time our path ahead goes down it usually means that before long it will start to climb and our final ascent into Campagnola was a long slow steady climb. I half expected to see a set of pearly gates and angels sat outside playing harps at the top. On our final mile into the town we past an Irish Pilgrim heading to La Storta. I mentioned the lateness of the day and how far he had to travel. He confessed that he'd had stopped for a beer and a rest that had then turned into two beers. I refrained from introducing him to 'Wee man' as that would have only deterred him longer. We briefly paused to locate our abode for the night.........."The chicken shed". We followed the Via Francigena to the edge of the town and soon heard the distinct sound of English voices..... Well a man from Seattle and a women from the Netherlands. With bags off our backs we settled into our chicken shed for the night......and despite its name.......it was quite comfortable for the price! A new day, and the beginning of the creation of a new Pilgrim route. In AD 595 Augustine was sent by Pope Gregory on a journey to Canterbury, England – this was known as the Gregorian Mission. Augustine left Rome and sailed to the small Lerin island, near Cannes, off the South of France, home to the Abbeye of Lerins a Cistercian monastery AD 410. The small party of about 20 monks then walked through France, sailed across to England, landing at Ramsgate before continuing to Canterbury. Shortly after AD 597 St Augustine founded the great abbey of Canterbury ( not to be confused with Canterbury Cathedral ) marking the rebirth of Christianity in southern England. Abbey Walks' mission is to recreate that journey and record it for other Pilgrims to follow. It is not possible to follow the first part of Augustine's journey from Rome to France by boat so the first part of the journey will now be completed on foot. The whole route will be recorded in three parts starting in 2017 and will hopefully be completed by the end of 2018. It is hoped that once completed, mapped and recorded the whole route will be walked in 2019 as one journey. The aim will be to stay in or visit as many Augustinian places of refuge or worship along the way. 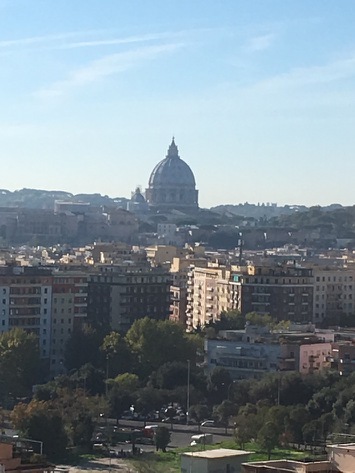 On a peaceful sunny Sunday morning we set off from St. Peter's Square and walked through the suburbs of Rome before ascending into Monte Mario park with a breath taking view back to the Vatican City. It was a slow climb but well worth it. When Claire and I walked together last year 2016, I introduced her to the Cornetto a le crème, basically a vanilla creamed filled croissant. It became either our staple breakfast or second breakfast. Our first day was hot with hardly a cloud in the sky, and the climb up into the park with our packs on soon had us looking for a place of refuge for a coffee and maybe our first Cornetto of 2017 ! Sunday is family day in Italy and we soon came across a bakery ( panne) with a small café. The place was very busy but a table was secured in the midday sun. Our packs were dispensed on chairs to make them easier to get back on, and soon we were indulging ourselves in our first Italian coffee and our first Cornetto - we were not disappointed. We both agreed that this was probably going to be the best one yet of 2017, it was that good. After a 20 minute break we donned our packs and set off again. We decided that the via Cassia route to La Storta was not the best route as it was the main road route into Rome with almost no footpath for pedestrians. Instead we decided to walk through the Reserva Naturala, a lovely green corridor mixed with parts of the original Via Francigena path. Our journey in the opposite direction to the normal route meant that we met several Pellegrini on their final day of their own Pilgrim journey to Rome. American, Italian, Dutch and English all with their own stories and reasons for completing the journey. Buon Camino being the final words spoken to each other. We are both 'posh walkers' and part way through the Riserva we stopped in the shade and dined on fresh advocado, tomatos and cheese, with fresh satsumas for dessert. With our energy reserves topped up we continued on our journey savouring the peace and tranquility knowing that it would soon end once we reached the via Cassia. I had not walked this route into Rome in 2016, so it was all knew territory for me and will certainly be a route I recommend to be walked either way in the future. By mid afternoon we reached the via Cassia and we slowly climbed our way along the busy, smelly route lined with queueing cars heading towards Rome. It was not a pleasant journey but a necessary one. With heads down we just got on with it and after a couple of hours we reached our final destination the Hotel Cassio. As we checked in, we grabbed two bottles of beer to take to our room, and water to rehydrate our hot and tired bodies. The room was simply furnished, we had a roof over our heads and we had a lovely balcony with crazed (well broken, but the effect was good) perspex panelling, and the via Cassia below. We sat on our beds, feet up on a chair, balcony doors open and savoured the vista and sounds of traffic before us. Day 1 completed !